We release new HRA features, fixes, or updates every two weeks, like clockwork. Here are four of the most relevant and exciting improvements of late. Full Support Articles will be coming shortly. A key feature for our clients is the ability to configure Email Notifications in the management portal. For those who are unaware, clients can configure specific emails to be sent to any hospital staff letting them know about certain types of assessment completion. The goal is to help route patients of differing risk-levels through the most efficient, tailored workflows. For example, there is an obvious benefit for nurse hotlines to be immediately notified when a High-Risk consumer completes an HRA. The downside is that this can quickly become cumbersome, especially if you are actively running a campaign and getting a lot of traffic. In fact, if you’re like most of the marketers we work with, you’ve already setup a Folder in your Inbox where these are all delivered only to wait until you’re ready to check them. We hear you loud and clear and that’s why we’re excited to announce the new optional Notification Digest! This allows you to setup your Notifications to come to you on your schedule, once daily. Setup is easy, but let us know if you want assistance. We can help you create a digest or otherwise get up to speed with Notifications. We disable portal user accounts after 90 days of inactivity. Customize this at the client level down to 30 days if needed. We compare new passwords to a massive list of compromised and common passwords. There is a new user agreement that portal users must accept when creating an account or when changing their password. Cybersecurity is a hot button issue for every health system we work with. Accordingly, we now offer the option to activate 2 Factor Authentication (2FA). You’re likely familiar with this if you have a Google account or even on your credit card portal. 2FA is another layer of security for your data and further prevents access by anyone other than yourself. If you’d like to activate 2FA on your HRA portal, we can help! Once Medicom Health activates it, anyone who logs in will receive a notice that they need to turn on 2FA when they login. The message will persist until the user activates it in their Profile page. Medicom Health is proud to be a highly interoperable tool in your marketing mix. We know that you may want to integrate with CRMs, outreach tools or marketing automation. With the addition of this new HRA feature, ActiveCampaign integration, you can now have a direct link between both systems. Of course, we can still execute email outreach directly from our portal, but we know that often times it benefits you to keep it in one seamless place. If you have Act-On, Marketo or ActiveCampaign, let us know and we can get you connected! Another big push for us recently has been to increase the field limitations for the contact information page. We understand that the limitation was frustrating for many of our clients – so we’ve updated that section so you can now add more than 7! Keep in mind that any fields more than 7 will create a second contact page and may decrease completion rates. You can lock the customization section at the corporate level. The navigation in that section have changed a bit to accommodate this feature, so reach out to us if you’d like a quick review. We think our commitment to constant improvement really sets us apart. If this is something you appreciate, let us know on our testimonial form. Thanks! 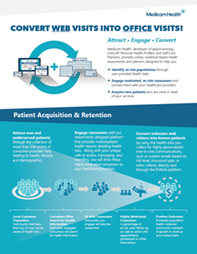 Is Your Website Optimized for Patient Acquisition?